Prime Minister Gaston Browne and Pakistan’s High Commissioner Agree to act on Mutually Beneficial Bilateral Relations. 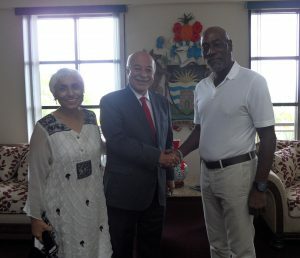 Prime Minister Gaston Browne meets with High Commissioner -Designate, H.E. Mr. Kamran Shafi and his wife. These were Prime Minister Hon. Gaston Browne’s welcome remarks, as he officially accepted Letters of Introduction from Pakistan’s High Commissioner-Designate, H.E. Mr. Kamran Shafi, to Antigua and Barbuda. PM Browne conveyed appreciation for the opportunity to meet H.E Kamran as his trip to Antigua is historic. This is the first time a High Commissioner has been accredited since Antigua and Barbuda established Diplomatic Relations with Pakistan. Antigua and Barbuda and Pakistan established Diplomatic Relations on 23rd September 2016. The bilateral relationship between the two sovereign states is governed by the principles of mutual respect and cooperation, shared commonwealth heritage and a passion for the sport of cricket. During the meet, PM Browne and High Commissioner Kamran shared a light moment as they spoke about the history of competitive cricket between the West Indies and Pakistan over the years. “I remember as a youth, the days when West Indies would give Pakistan some blows,” Prime Minister Browne said in jest. The High Commissioner agreed, stating that no-one can ever forget the days of Vivian Richards. The High Commissioner detailed his talks with the Foreign Ministry which he has had thus far, describing them as successful. They discussed areas of cooperation and collaboration. One of these areas of collaboration was the production of textiles. The High Commissioner noted that the “finishing of textiles in this country (Antigua and Barbuda) is an area of potential collaboration; the raw materials would be shipped here to have them finished here. Pakistan would send the expertise in a joint venture with an Antiguan producer,” the High Commissioner proposed. High Commissioner Kamran went on to explain that such a venture will result in direct distribution to the local market and neighboring countries. High Commissioner Kamran went further to express other ways in which the two countries can benefit from cooperation. Aviation, for example, is one area in which to collaborate with Antigua. Pakistan is known for the mass production of airplanes at competitive rates. Prime Minister agreed that in the interest of LIAT, this is an area his government will examine. 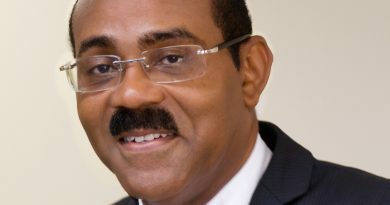 Prime Minister Browne articulated that Antigua and Barbuda welcomes the opportunity to deepen and expand the bilateral relations between Antigua and Barbuda and Pakistan. PM Browne noted that his Government shares an optimism about trade and investment. Agriculture, infrastructure, telecommunications and equipment-supply are other areas of interest for the two nations. The High Commissioner responded that he will put together a paper, detailing the areas of cooperation to take back to Pakistan. 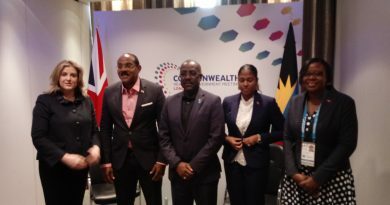 Prime Minister ended by asserting Antigua and Barbuda’s commitment to the establishment of strong bilateral relations with countries within the international community. During his visit, the High Commissioner also had the opportunity to meet and discuss matters with Minister of Foreign Affairs E.P Chet Greene. High Commissioner also had the occasion to meet with Sir Vivian Richards and was delighted to recap some of his exploits on the cricket filed in Pakistan. High Commissioner -Designate, H.E. Mr. Kamran Shafi and his wife shares a light moment with Sir. Vivian Richards.